Dr. Gdovin graduated from Wilkes University in 1986 with a Bachelor’s degree in Biology. She graduated from Wilkes Barre General Hospital school of Medical Technology in 1987. From 1987 to 1990 she was a clinical toxicologist for SmithKline Beecham Pharmaceuticals and Bryn Mawr Hospital in Suburban, Philadelphia,. She then returned to graduate school at the Pennsylvania College of Optometry in Philadelphia where she earned her Doctor of Optometry degree in 1994. During her optometric training she completed internships at the Feinbloom Low Vision Clinic in Philadelphia, the Pediatric and Binocular Vision Center of The Eye Institute in Philadelphia, Clompus and Reto Vision Associates in West Chester, PA and the Bryn Mawr Hospital in Bryn Mawr, PA. These clinical rotations included study and practice of optometry in its various disciplines under several prestigious eye physicians including Richard L. Brilliant, O.D. FAAO, Dr. James Carty, M.D., and Stephen Reto , O.D. FAAO. Dr. Gdovin is nationally board certified and licensed in Pennsylvania in the treatment and management of ocular disease. She practices full scope optometry including, but not limited to, the treatment of glaucoma, dry eye, various infections of the eye, ocular allergies and corneal abrasions as well as the detection of ocular conditions such as cataracts, macular degeneration, and other systemically derived ocular diseases such as hypertension and diabetes. Dr. Gdovin practices complete family eye care from as young as 4 years of age to seniors. She specializes in contact lens care, including more specialized fittings such as toric lenses for astigmatism, multifocal lenses for trouble with vision at near and contact lenses for dry eye patients. 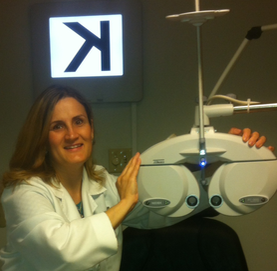 Since 1994 she has been in private practice in several offices in Suburban Philadelphia, Pennsylvania.In 1998, she became a staff optometrist at Suburban Eye Associates and worked with Alan Dorfman, M.D., a glaucoma specialist until 2010. In 2008, she became a staff optometrist at Huntingdon Valley Eye Care Consultants, LLC in Huntingdon Valley, PA, an office of three ophthalmologists and two optometrists, where she practiced for seven years. 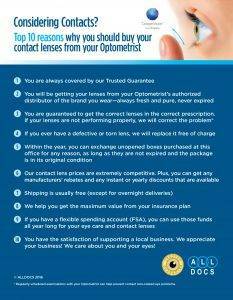 In 2014 she became a staff optometrist of Brewer Eye Associates, where she currently practices full time. She is a member of the American Optometric Association, Pennsylvania Optometric Association and Montgomery County Optometric Society. Dr. Gdovin lives in Horsham with her twin children and dachshund.